Halloween there wasn't a black cat or witch's hat anywhere to be seen. 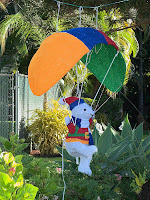 Residential yards are an entirely different matter now with Hang Gliding Christmas Bears and Reindeer galore. I even saw a car drive by this morning with antlers on either side and a big red nose up front. Thank goodness this is a serious Holy-Day with no room for crass commercialization.